Ed Sheeran reveals what went down when Tyler, Josh and Bieber hung out at his after-party. Ed was chatting to official "hardest working man in showbusiness" Ryan Seacrest on his ever-popular radio show when the subject of awards show afterparties came up. Sheeran then revealed his one party rule - no security or celeb entourages are allowed. And the best thing about this rule? Weird celebrity pairings as people just turn up and hang out. 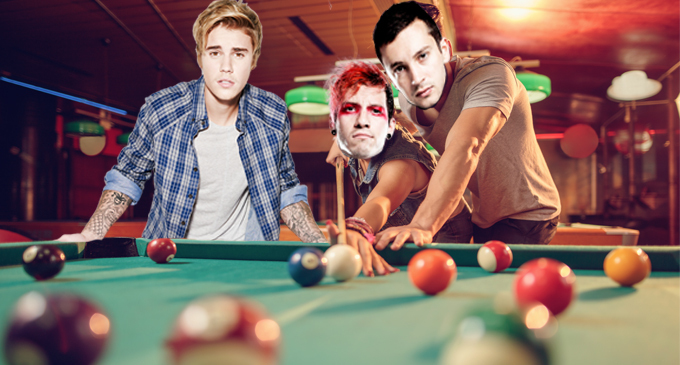 For example, as Ed explains, a bouncer-less Justin Bieber just casually ended up playing pool with Tyler and Josh. "So [Justin] Bieber came by himself and played pool with Twenty One Pilots. And that was a nice thing, rather than Bieber hanging around with his entourage in the corner." 2) Who was stripes and who was solids? 3) Were Tyler and Josh paying particular attention to the red and black balls? 4) Is Tyler tall enough to reach across the table or did he have to lift one leg off the ground? 5) Did Josh and Justin swap any kind of hair tips? Answers on a postcard please Ed - this sh*t is important! TØP are of course noted fans of the Biebs, having previously covered 'Love Yourself' as part of a medley during the Emotional Roadshow tour they are currently wrapping up in North America. Will Justin return the favour on his next tour? Only time will tell.